There are classic character pairings in Star Wars, R2-D2 and C-3PO, Han Solo and Chewbacca, and Rogue One introduced Baze Malbus and Chirrut Îmwe. The former Guardians of the Whills, embodied in the performances of Wen Jiang and Donnie Yen, provided a hefty portion of the film’s heart and comedy, and while Rogue One definitively told us the story of their end, ever since fans have been demanding more of the two. Thankfully, Greg Rucka’s The Guardians of the Whills is the first of what we hope are many installments into the lives and adventures of the two men, and it’s the second best literary return to Jedha since Alexander Freed’s novelization of Rogue One. A season professional when it comes to writing with hundreds of projects under his belt, Greg Rucka has previously written Before the Awakening, three short stories about Rey, Poe Dameron, and Finn, as well Smuggler’s Run, a Han Solo and Chewbacca adventure set during the original trilogy. Rucka also wrote the first piece of post-Return of the Jedi material after the canonical reset by Disney, Shattered Empire, a four issue comic book series by Marvel in the fall preceding The Force Awakens. Needless to say, Rucka does knows Star Wars and he can write Star Wars, and he brings this to bear in his most recent work. A short book, The Guardians of the Whills introduces Baze and Chirrut not long after the Imperial occupation of Jedha begins, and weaves a story that concludes a few months before Jyn Erso finds herself wandering through the crowded streets of the holy city. Guardians is successful largely in part because Rucka reveals an intimate familiarity with the characters, the odd couple matching of Baze and Chirrut, and each of their unique qualities and traits, such as Chirrut’s resolute positivity that’s countered by Baze’s penchant to expect the worse. Reading Guardians of the Whills, the voices of Jiang Wen and Donnie Yen instantly come to mind when either of their respective characters speak, and with a nod to Rucka’s ability to channel his characters, every line sounds as if lifted from scenes cut from Rogue One. Our guardians are not the only major characters in the story. Saw Gerrera and his fighters represent a major element of Guardians of the Whills, and like everything connected to Gerrera since Rogue One, each additional exposure to the character has added depth to the character that the film simply did not have time to provide. Again, like Chirrut and Baze, the voice of the actor who portrayed the character springs to mind when his dialogue appears upon the page, and Forest Whitaker’s soft voice, worn by years of struggle against the Empire, is at home with Rucka’s writing of Saw. Guardians provides a little more background into the when and how Gerrera’s partisans arrived on Jedha, as well a glimpse of the zealous passion Saw carries for attacking the Galactic Empire. How Baze and Chirrut interact with Gerrera comes to define the pair at their heart and explains one reason why they end up joining Jyn on her mission to Scariff. In the Rogue One novelization, one of the best parts was an interlude written by Freed, which leapt away from the film to show glimpses of the people of Jedha moments before it was destroyed by the Death Star. It breathed life into a setting in a film, and Guardians of the Whills continues that effort of bringing the reader to Jedha not to simply see it whirl past as one part of a journey to many places, but as a living, breathing place, where people worked, slept, and enjoyed cups of even the bitterest teas. It fully places Chirrut and Baze into their home and explains not just how Jedha became, as Jyn described it, “a war zone,” but how the people of Jedha suffered under the Imperial flag up until the moment everything ended in a flash of green light. Nothing Greg Rucka has written under the Star Wars banner has been short of enjoyable, and Guardians of the Whills continues the streak of making Rucka a sure fire bet when it comes to picking up something that will offer an adventure that’s fun, quick and delightful in the Star Wars universe. That Rucka seems to possess a supernatural ability to understand his characters and write their voice makes every endeavor of his a worthwhile read. 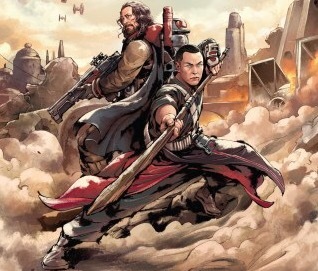 In Guardians, Rucka returns us to Chirrut Îmwe and Baze Malbus, two characters who definitely deserved more exploration after Rogue One, and he succeeds in providing one more chapter of the lives of the Guardians of the Whills.